Speaking of Austin, my Aunt Sheila is from there (Well, technically she is from Dothan, Alabama, just like the rest of my Dad’s siblings, but she has lived in Austin as long as I’ve been alive. ), and whenever I think about a great cook, a picture of her big smile drifts across my mind. I’m sure there are some technically greater “masters” that I’ve come in contact with through the years, but Aunt Sheila has a joie de vivre that makes everything pop. She loves life, and food, and cooking, and even if you think Texas popcorn (that would be fried jalapenos) isn’t your thing, I guarantee that if you had it from her happy hands in her warm and alive kitchen, you’d be won over in a moment. I have an especially great love of her now, because she has lived in Dothan for the past year or so (because of some temporary changes in her husband’s job), and has single-handedly rescued my Dad from a life of tomato soup and peanut-butter-and-jelly sandwiches…the thought of which kept me up at night after Mom passed away. 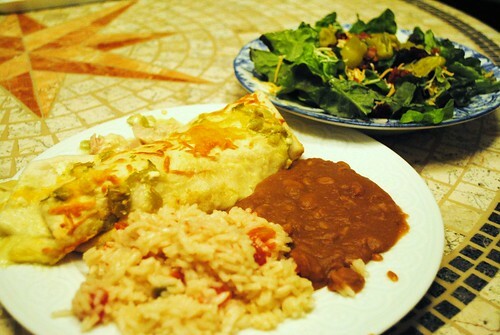 Saying all that, I would now like to share Aunt Sheila’s Chicken Enchilada recipe! Can I give a shout-out to Jenny Strange here? Who emailed me for this recipe over a month ago, and I haven’t responded because I’ve been meaning to post this recipe for that long. Sorry Jenny, but here it is! 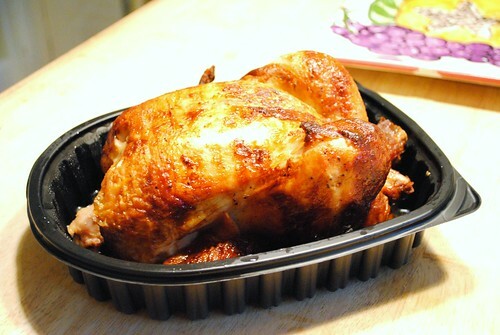 Every time a casserole calls for “chicken”, it’s what I use. It’s tender and tasty and worth every last one of it’s five dollars. (I think they sell them at all grocery stores that have a hot food section–including Walmart, but I will say that they are best from Sams.) I also pour my “drippings” (you know, that juice in the bottom of the dish holding the chicken) into a pan where I will later make my rice. Don’t turn your little nose up! I guarantee that every good southern meal you’ve ever had, has been due to the magical presence of drippings. 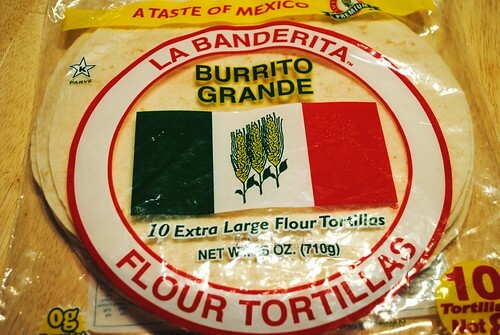 Then, take your flour tortillas, Fill them with a few tablespoons of your chicken/cheese filling mix. Tuck ’em and roll ’em. 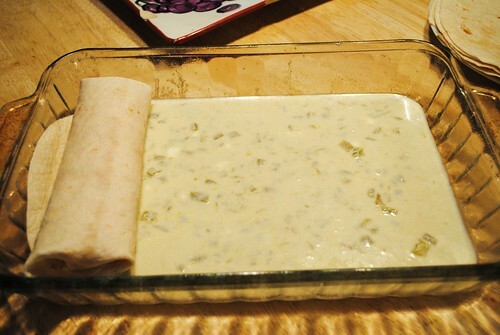 Pour the rest of your white sauce over the top (scooting the rolls around a little to get sauce in all the crevices). Sprinkle with some grated cheese (if you happen to have some in the fridge like I always do) to add some color, and bake at 350 until bubbly (30-45 minutes). I open the can and dump them in a pot to warm over the stove. 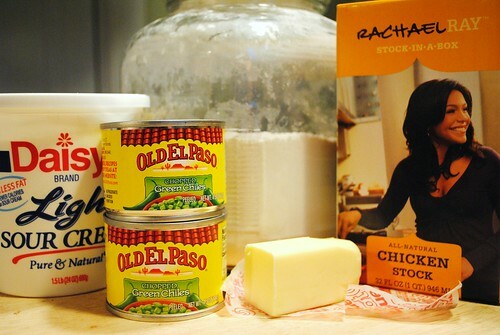 Take out your bubbling, delicious enchiladas. And serve it up (With a salad, of course, if you have the last name Maddox and you can’t eat dinner without one)! I’m sorry that this picture is so bad. Is that drop of refried beans on the white plate driving anyone else crazy? By the time I was making plates, my girls were sitting at the table banging their forks (we’re so civilized!) and Jeremiah was standing behind me saying, “Are you seriously taking pictures of our dinner plates?! Step away from the camera.” as he tried to slide his plate away. 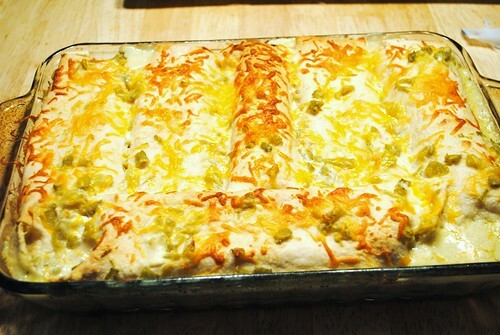 So, the finale picture is bad, but I hope you enjoy Aunt Sheila’s Enchiladas!!!! Thanks for the recipe Abby! We'll try it this weekend. Looks delicious!! 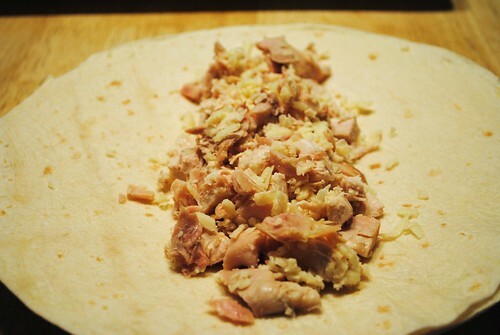 2 cans pinto beans (I prefer Bush's, they really make a difference when making refried beans)1 onion chopped, and 1T. 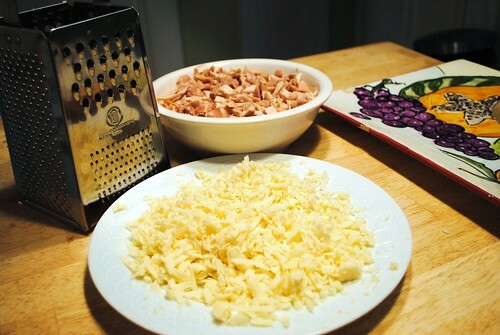 chopped or minced garlic (i buy the pre minced garlic). Saute' your onion and garlic in about a Tablespoon of canola oil. Add the onion first and then the garlic a little later so the garlic doesn't burn. When the onions are translucent (sp?) add your beans and simmer for a few minutes. Add lots of salt and pepper (to taste), then mash with a potato masher…they're delicious! Much better then the canned, although I do enjoy the canned in a pinch! Try it…it's super simple! YUM, YUM!! This looks amazing! I will have to try it. Wait! Maybe since your Aunt Sheila is our next door neighbor, she will make some for us?? Especially since I took her some homemade cinnamon rolls a few weeks ago?? 😉 Just kidding, Aunt Sheila! That salad brings back good memories. We haven't made one Maddox style in a while. Cheese, banana peppers, craisins, etc. So good! 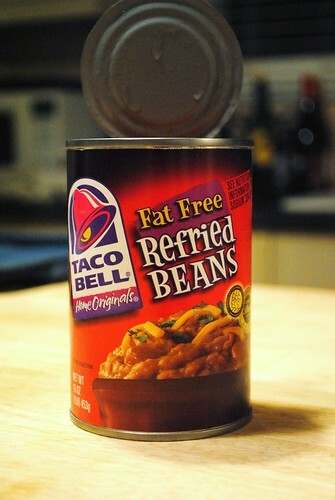 Oh, and don't be ashamed of the refried beans. I'm a pinto girl myself. Oh my those look so good!! I have always wanted to make enchildas but seriously every recipe calls for cream of something soups which I refuse to include (sames goes for lasagna). I am totally going to make these on my next meal plan. Those look amazing! I will be trying them next week for sure! Just wanted to post that I made these about 2 weeks ago and they are slap yo mama good. I am in love with them and am making them for company this Tuesday. I still haven't tried your bread but will eventually. I can't remember how I found you but I went to HS with Jeremiah, Tommy and all of them, maiden name Greer. I love your blog, you are so genuine and it shows in all you say and do.